Release Date:12/09/2016;Notes:LP version. 180 gram vinyl with obi strip. Far Out Recordings present a reissue of Jose Mauro's forgotten masterpiece Obnoxius, recorded in 1970 for Quartin. Over the course of the '60s, Roberto Quartin released more than 20 albums in Brazil on his label Forma, by artists including the likes of Eumir Deodato and Quateto Em Cy. Selling the rights of Forma to Polygram in 1969, Quartin struck out for pastures new at the dawn of the 1970s with the launch of his self-titled label. 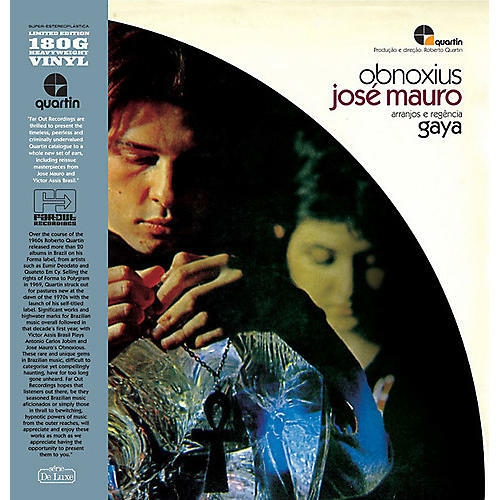 Significant works and high-water marks for Brazilian music overall followed in that decade's first year, including Obnoxius. Jose Mauro is an increasingly rare phenomenon. Mauro is said to have died in a car accident shortly before the release of Obnoxious, a fact that could have lent his brief musical career a touch of mythology were it not for how scant the details concerning any other aspects of his life are. Production on the record was cancelled after Mauro's death and it was never sold commercially until it was re-released decades later. The title track is a wholly singular piece of music, blending string-drenched melancholia with orchestral pomp, sunny psychedelic strumming with propulsive percussion, topped off with Mauro's yearning vocals. The result is indicative of Mauro's unique blend of sounds from Latin jazz and samba to psychedelic folk and baroque orchestration. Today, Obnoxious retains it's strange, otherworldly appeal - a firm favorite among a small circle of deep diggers including Madlib, Gilles Peterson, Floating Points and DJ Nuts. Jose Mauro's mournful and melancholic vocals create a dark, brooding atmosphere that stands in contrast to the usual joyfulness and high-spirited rhythm of the more prominent Brazilian music of the era. Despite this air of foreboding, Mauro's confident baritones, chord patterns and sumptuous arrangements have the ability to induce in the listener in an almost trance-like state of ecstasy. Obnoxius is Mauro's long hidden masterpiece, a complex and uniquely stunning work. All tracks on the record were composed by Mauro and Ana Maria Bahiana. Personnel: Maurilio - trumpet Paulo Moura - alto sax Altamiro Carrilho - flute Rildo Hora - harmonica Salvador - organ, piano, harpsichord Geraldo Vespar - guitar Jose Mauro - violao Sebastiao Marinho - bass Juqinha and Mamao - percussion Wilson das Neves - drums Roberto Quartin - string formation.